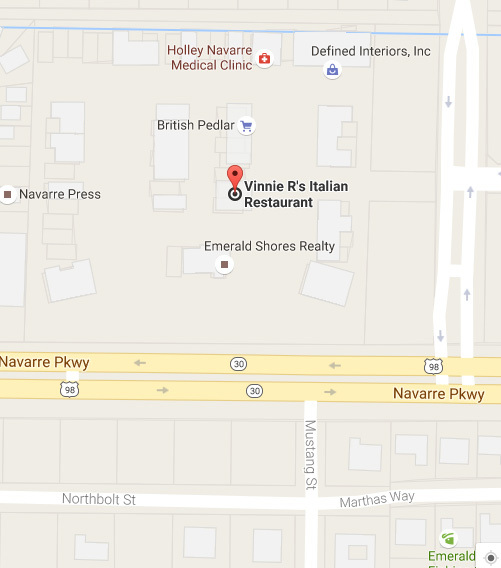 We are located in Harvest Village Center on the North Side of Highway 98. We are approximately 2 miles from the light located at the Publix Shopping Center, or approximatly one mile from the Postoffice. Look for the electronic Harvest Village billboard located on the right after the Coral Street light/East Entrance of Holley by the Sea. We are approximately 2 miles from the light located at the West Entrance of Holley by the Sea. Look for the Vinnie R's billboard that says make next left. If you should get lost, feel free to call! We are available for catering/holiday events! We appreciate a 'heads up' for parties over 8.